When people are living near busy roads, or simply do not like having their cat go very far when they are outdoors, an outdoor enclosure can be very helpful. While it does keep cats in a small area, it still gives them a chance to enjoy the outdoors while you don’t have to worry about where they are. Kittywalk has become one of the leading manufacturers of cat enclosures. They have a wide range of different models that are ideally suited to different domestic situations. But how do you know which one is the right one for you? We will hope to answer that question for you as we look at four of the most popular enclosures on offer from Kittywalk right now. We will also attempt to answer any questions you might have about the enclosures to give you a better idea of which want will be right for you and your cat. This is one of the most popular enclosures from Kittywalk, mainly because it is designed to be placed on garden patios, balconies and decking. This enclosure is self-standing, so all you need to do is place it on your patio and your cats will be able to get inside and roam around the interior freely. It is weather resistant so it is able to handle almost anything and it has two stable doors, so then you can get your cat in and out of the enclosure with ease. Some customers have complained however that the netting on the enclosure can start to break whenever it is left outdoors for long periods of time. The solution to this though would be to simply keep it outside while your cat is outside and then fold it up in its helpful travel case and bring it indoors when the cat has finished. 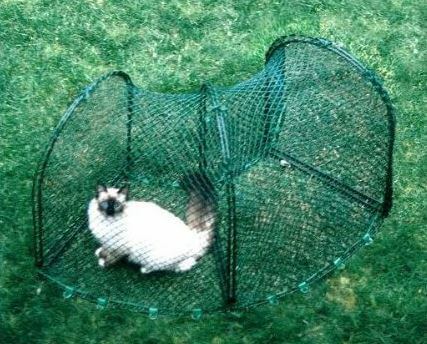 While some customers have said that their cats have been able to tear at the netting on the enclosure a little bit, they will not be able to tip the whole thing over. Even though the enclosure is not secured to the ground in any way, it is still very stable on the ground and it would take a great deal of strength from a cat to tip it over. The netting on the enclosure is made of a soft material to ensure that the cats are fully comfortable when they are inside. At the same time the netting is very secure as well, so you do not need to worry about your cat being able to pull the netting apart to try and escape. 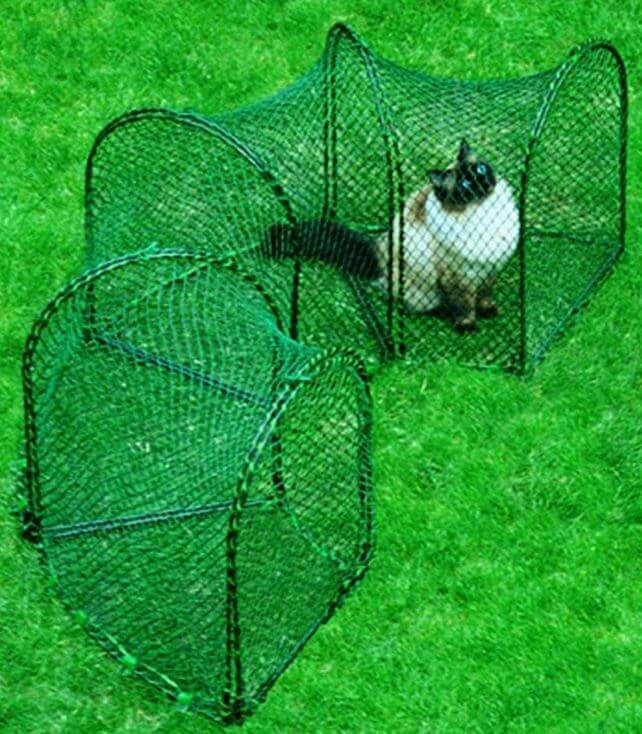 This cat enclosure is ideal for anyone that wants to keep a couple of cats amused while they are outside. This particular enclosure comes with the regular enclosure we previously looked at, along with a kabana and a penthouse for the cats to play and sleep. The penthouse is another level above the kabana, which means that your cats will be able to get comfy and enjoy the nice weather. The only downside to this model is the time that is required to assemble the entire thing. While the previous enclosure was nice and easy to put together and fold away, this one is a lot more complicated and requires a great deal of patience. If however you want this enclosure to sit permanently outside so you can just place your cats inside it, then it is definitely worth considering. The hammocks inside the enclosure are very strong and should be able to hold a fully grown adult cat regardless of its weight. While the hammocks themselves are held to the enclosure by hanging from the netting, it is made of very strong material so there is no need to worry about a large cat breaking the hammocks or the netting on the enclosure. This would depend entirely on the height and size of your cat flap If it is big enough to open into the entrance of the enclosure, but not too big that your cat can get past the enclosure and escape, then it should work just fine. Also take into account if your door is one a step, in which case it may be too high. As long as you test it to make sure that your cat will be able to get from the cat flap to the enclosure safely, then there should be no problem with doing this. This enclosure is not that different from the one we just looked at, except this one is just the tower instead of the full long enclosure. This is ideal then for someone who has a couple of cats living in a small apartment or in a house that has a small garden. 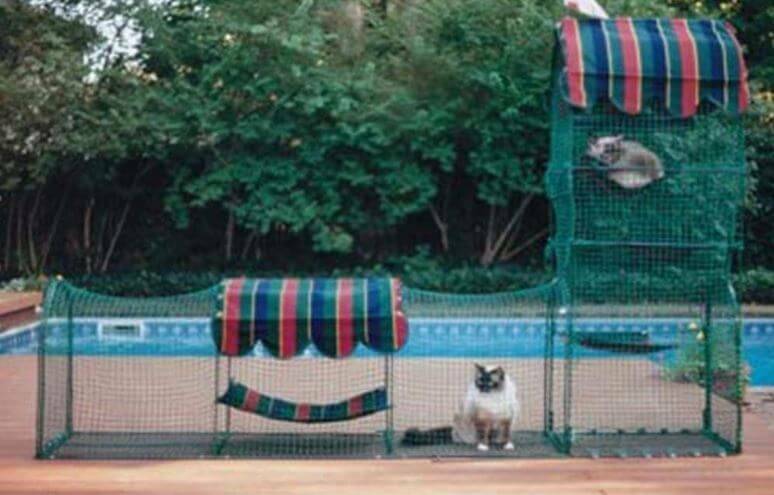 This enclosure is able to accommodate three cats in comfortable hammocks, so then they can sit outside and relax. Some customers have complained that this particular enclosure has plastic latches for the doors, which some owners have considered to be too flimsy in order to keep their cats shut inside. In most cases however, cats will not be able to undo the latches and escape. If this is something that is concerning you, then there are a wide number of things you can use from your own home in order to reinforce the lock so then you have piece of mind. Getting the cats out of the penthouse is nice and easy and doesn’t take that much work. Both of the doors for the enclosure are on the side, so all you need to do is open the up and you will be able to reach inside and pick up your cat, or simply leave the door open and allow them to walk out themselves. The doors give enough room for you to reach up inside and pick up cats that are sleeping at the top of the penthouse. This is entirely up to you. Leaving the doors of the enclosure open does not effect the sturdiness of the penthouse, so you do not need to worry about it being unstable if the doors are left open. While this is not a complete enclosure like what we have looked at previously, this is an additional tunnel that can make your cat’s enclosure that little bit more enjoyable for them. These enclosure add-ons can be bought as sets of two or four, so then you can build you own enclosure that you think will suit your cat best. If you have several cats, this is a great way of building an extension onto your current enclosure, or even connecting two penthouses together. These curves can be connected onto any of the Kittywalk enclosures safely, so you do not need to buy any additional material or parts in order to get them connected. 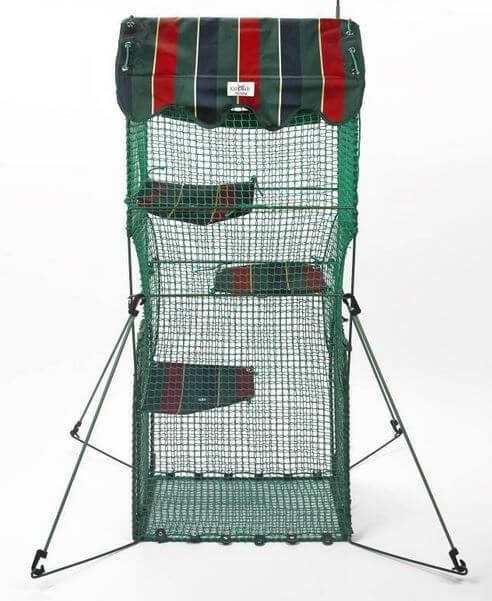 They are also made of netting that is easy to fold away, so you will not have to spend a lot of time folding the complete enclosure away when you want to bring your cats back inside the house. Yes, this made from the exact same netting. This means that much like the complete enclosures, these tunnels are made from a soft netting that keeps your cats comfortable, but at the same time prevents the risk of them scratching their way out and escaping. Full details on how to connect the tunnels to the enclosures will be in the instructions, but it basically involves connecting the two together via the entrance doors. All you have to do is connect the tunnel door to the enclosure door and clasp the two together using one of the plastic locks provided. That is all you need to do in order to add the extension. There are not many companies out there right now that offer high quality cat enclosures quite like Kittywalk. 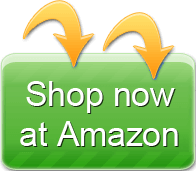 Their wide range of enclosures mean that you are almost certain to find something that is suitable for your cats and your domestic situation. To make it even better still, you can buy extensions so then you build an enclosure that you know will suit your cats best.